Jacob Bunge reported yesterday at The Wall Street Journal Online that, “U.S. grain and soybean futures closed sharply lower Wednesday—with corn sinking to the lowest level in more than four years—after government and private-sector reports reinforced expectations for massive harvests ahead. “Corn futures for September delivery fell 4.1%, the biggest decline on a percentage basis since June 30, pressured by reports from Allendale Inc. and Lanworth estimating high yields that may translate to larger U.S. grain stockpiles, analysts said. Yesterday, the Federal Reserve Board released its Summary of Commentary on Current Economic Conditions. Commonly referred to as the “Beige Book,” the report included observations with respect to the U.S. agricultural economy, a complete summary of these observations has been posted here, at FarmPolicy.com Online. Meanwhile, Kelsey Gee reported yesterday at The Wall Street Journal Online that, “Animal health company Zoetis Inc. said it received a conditional license from the U.S. Department of Agriculture for a vaccine to combat a swine virus that’s estimated to have killed millions of pigs since entering the country last year. In other developments, Leslie Josephs reported in today’s Wall Street Journal that, “Brazil’s sugar industry is slimming down, a shift that producers hope will deliver them from a yearslong glut that has depressed prices. “The sugar surplus has led processors to shut dozens of mills and some growers to invest less in their fields. 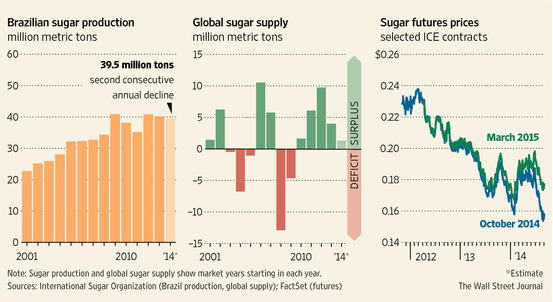 The moves highlight the desperate economics of the domestic sugar industry following an ill-fated expansion. The Journal article noted that, “The effect of the cutbacks in Brazil, which is the world’s biggest producer of the sweetener and accounts for more than 40% of exports, hasn’t yet hit the world marketplace, where prices are near their lowest in more than six months. But many analysts expect the impact to be felt as soon as next year. The DTN article explained that, “While the official August data hasn’t been released, the market estimates that 6.25 mmt (227 mb) were imported in August, bringing the total for the year to 70.25 mmt (2.58 billion bushels), said Zhonghua Wang, market analyst in Beijing. Jacob Bunge reported in today’s Wall Street Journal that, “When Monsanto Co. purchased Climate Corp. for $930 million last year, it got a San Francisco-based startup that crunches weather data to improve crop yields and design insurance. It also got David Friedberg, the company’s 34-year-old co-founder, who may prove an even more valuable asset. Mr. Bunge indicated that, “The lifelong vegetarian has also emerged as an unlikely champion of Monsanto at a time when the company—and the business of genetically engineering crops that it pioneered—face intensifying attacks. Meanwhile, Scott Wong reported yesterday at The Hill Online that, “Speaker John Boehner told his conference on Wednesday that the September legislative session will be ‘brief but busy,’ giving Republicans a chance to paint a ‘stark contrast’ with Democrats before the November elections. However, Mario Trujillo reported yesterday at The Hill Online that, “Speaker John Boehner (R-Ohio) on Tuesday said Congress could tackle immigration reform next year if conditions are right. Also with respect to the budget, Benjamin Goad reported yesterday at The Hill Online that, “The largest food safety overhaul in generations is being starved of funding needed to enforce a host of new regulations for factories, farms and importers, safety advocates warn. “The 2010 Food Safety Modernization Act (FSMA) was billed as creating a fundamental shift in the way government protects the nation’s food supply against the threat of food-borne illness. Reuters writer Ros Krasny reported yesterday that, “The percentage of Americans regarded as ‘food insecure’ – lacking access to enough food for a healthy life – has declined in the past few years but still represents over 17 million households, the U.S. Agriculture Department said on Wednesday. “About 14.3 percent of households were termed food insecure in 2013, down from 14.9 percent in 2011. Bloomberg writer Alan Bjerga reported yesterday that, “North Dakota’s oil and gas production boom has boosted incomes and, according to a government report today, left the state with the lowest percentage of households struggling to afford food. Janet Hook and Mark Peters reported in today’s Wall Street Journal that, “Upending the U.S. Senate race in Kansas, the Democratic candidate has withdrawn from the contest, leaving Republican Sen. Pat Roberts with a narrowed field and a potentially formidable opponent in an independent candidate. “The development may turn the race from a fairly safe contest for Mr. Roberts into a more difficult election. Alexandra Jaffe reported yesterday at The Hill Online that, “Despite filing papers with the Kansas secretary of State withdrawing from the Senate race late Wednesday, Democrat Chad Taylor may be stuck on the ballot this fall.